Tom Douglas is a big name in the restaurant business here in Seattle. His chefs recently started preparing dishes for Lish (an online meal delivery service). 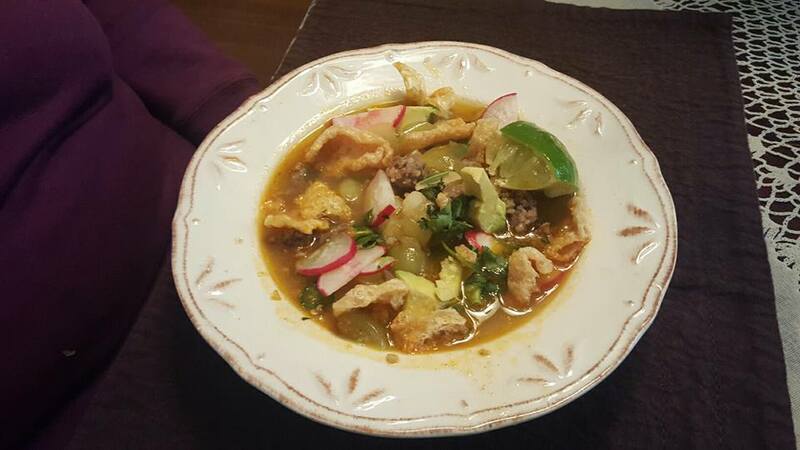 Last week, I tried the Smoky Pork Pozole and loved the flavors! I knew I had to try and recreate it. Most of the recipes I found online used tomatoes instead of tomatillas. So, I found a recipe to use as a starting point, then changed some of the ingredients to make it more like the one I had eaten. This is my version. In a large pot, heat 2 teaspoons of olive oil on medium-high until hot. Add the ground pork; season with salt and pepper. Cook, frequently breaking the meat apart with a spoon, 3 to 5 minutes, or until lightly browned and just cooked through. Transfer to a bowl and set aside, leaving any drippings and browned bits in the pot. Add 2 teaspoons of olive oil to the pot. Heat on medium-high until hot. Add the garlic, onion and the spices; season with salt and pepper. Cook, stirring occasionally, 2 to 3 minutes, or until softened and fragrant. Add the tomatillos. Cook, stirring frequently and breaking apart the tomatillos with a spoon, 4 to 6 minutes, or until they have softened and begun to thicken into a sauce. Add 4 cups of water to the pot; cook, stirring constantly and scraping up any browned bits from the bottom of the pot, 30 seconds to 1 minute, or until thoroughly combined. Add the hominy and browned pork; heat to boiling on high. Once boiling, reduce the heat to medium and simmer 7 to 9 minutes, or until slightly reduced in volume. Remove from heat. Stir in the juice of 1 lime wedge. To serve, ladle the stew into a bowl. Garnish with radish, chilies, cilantro, avocado & pork skins.